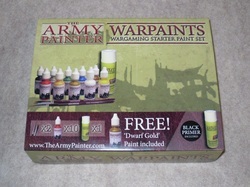 There's not very many options out there at present in the way of starter paint sets for the wargaming enthusiasts. Games Workshop used to be one of the only options available, but even it was usually overpriced. More recently GW quit offering their starter paint set altogether, because at their site it says "no longer available" under "Availability". Thankfully there's a couple of new options out there now that may be worth pursuing, one of which we'll look at now. I looked at the Mantic Games Undead Paint set a few months back, and they use Army Painter's Warpaints in all of their paint sets. I was only able to use a few of the Warpaints colors at the time, because that paint set comes with only six ½ oz (15ml) bottles of Army Painter's Warpaints. Actually Mantic Games had the Warpaints available months before Army Painter released Warpaints through their own webstore. I don't quite understand the idea behind that, because in doing so they end up putting themselves in a unique situation. Army Painter is in direct competition with themselves, because at present there's two ways to get the Warpaints. You can buy them through the Army Painter's online webstore(s) in this Warpaints: Wargaming Starter Paint Set, and from Mantic Games in their own Mantic branded paint sets, and from Mantic in single bottles. Lets see what's in the Warpaints: Wargaming Starter Paint Set box from Army Painter. This set includes 10x bottles of Warpaints colors, 2x brushes, and a small 150ml can of aerosol matte black primer. The colors included are black, white, red, blue, green, yellow, flesh, brown, metal, and they claim gold is free bonus bottle of Warpaints. The brushes are rather nice, as they include an Army Painter Hobby branded Basecoast brush, and a Hobby branded Drybrush. That's something new, because the drybrushes I have from Army Painter are the white handle variety Wargamer-branded brushes, this is the cheaper Hobby branded version with a red handle. I reviewed the Hobby and Wargamer-branded brushes both not that long ago, and found that both lines make excellent starter brushes. You really can't go wrong with either option. I like that they've created a new Hobby-branded drybrush for this set. That's a really nice touch, and it's an essential tool for a new-blood painter to have. 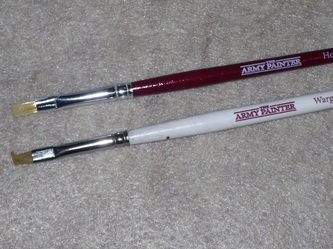 The design is definitely different than the Wargamer-branded dry brushes from Army Painter. It looks almost identical to the head found on their stippling brush, where as the Wargamer-branded brushes are cut at an angle, and are thinner in width. This one does a nice job. Quite frankly, most any stiff and somewhat short bristled stippling brush, will usually drybrush as well as any other, and in the past I've used stippling brushes to drybrush long before even GW made a drybrush specific brush. So to take a stippling brush, and turn it into an affordable Hobby-branded drybrush is just smart on their part. There's also a small can of their matte black aerosol primer in the box. 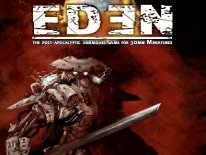 This is a great primer, and I'd have to say it's easily as good as GW's Chaos Black, only at a fraction of the cost. In comparison, the regular full size cans are 400ml, so this little can is a wee bit smaller than half an actual can of Army Painter aerosol primer. Topping off the box is a small pamphlet with warnings and instructions on how to use the primer, plus some adverts for other Army Painter products. I've already used many of these colors for quite some time now, because I've been using the Warpaints bottles from the Mantic Undead Paint set ever since that review was posted back in late May. One thing I noticed is that this set is missing the Bone and Armour colors that comes only with the Mantic Undead Paint set. They do include White with this set, but I get a lot of use out of Bone, which is essentially their version of GW's Bleached Bone. They also include Metal in this set, which is a lighter silver-like shade, where as Armour is more like a shade darker than bolt gun metal. Therefore there's a total of 12 colors currently available in the entire Warpaints range so far, but only 10 colors are included in this set, and I can't see why they didn't just include them all in this set. Leaving just two out is kind of silly. There's room in the box even to accommodate 2 more bottles, so it's not like there wasn't room. The other colors that are new to me are gold, flesh, brown, yellow, metal and green. The black, bone, white, red, and blue all offer nice coverage, and have a consistency like Vallejo and Reaper Master Series. Those are the colors I've used for months now. They also all thin down nicely if needed, without loosing color. The flesh, brown, yellow, and green in this set yield the same results, as I've sat down and used them quite a bit now as well. Granted you will still require more than just two coats of white, bone, flesh or yellow over black primer, as these lighter colors are no different than Vallejo or Reaper Master Series in terms of coverage over black primer. Now the other darker colors like red, blue, brown, and green manage to require only a few coats over black primer in most cases, depending on how much you thin the paint before application. Therefore they also come close too matching the results I usually get with Vallejo and Reaper Master Series. At present there's only three metallic colors to work with Metal, Armour and Gold. Armour is essentially like bolt-gun metal from GW (only a shade darker), and it's the one metallic color missing from this set, but comes with the Mantic Undead set. Gold is more like the middle shade of gold from GW, it's not too shinny, but not too dark either, and Metal is similar to a general silver. The metallic colors just seem too thin, as if maybe there's more medium than pigment in them, or they use a really light metallic pigment like the Derivan Art MiNiS line. Even after vigorous shaking, the consistency is just a bit thinner than what I'm comfortable with using. The Metal color seems easier to work with than the Gold too, as the Gold seems even thinner than Metal. Once on a model and dry the results of either metallic shade looks nice, but if given a choice I'll reach for my Reaper Master Series and Vallejo metallics first, over these metallics. Don't misunderstand me either. These aren't bad metallic paints at all, they're just not of the same thickness as what I'm used to getting right out of the bottle with other products that I use day in, and day out already. Some painters may actually prefer these metallics over what I prefer best, and for the very same reason I don't find them as useful, because I'm not a painter to lay down 10x thin coats, especially if I know I can do it in 2-4 coats with what I prefer to use most. I simply prefer thicker paint, because you can always thin a thicker paint with water, but can't as easily thicken a paint that's already too thin. It's all a matter of preference really. Here's a rundown of what I think best match the other colors... The brown is a medium brown (GW's Bestial brown maybe? ), the yellow is a medium-yellow (Sunburst yellow maybe? ), blue is a medium blue (Ultra Marine blue maybe? ), but red is definitely close to GW's blood red, the flesh tone looks more like GW's Elf Flesh than GW's Dwarf Flesh, as it's lighter, and yellow-er, and the green looks exactly like GW's Snot Green shade. 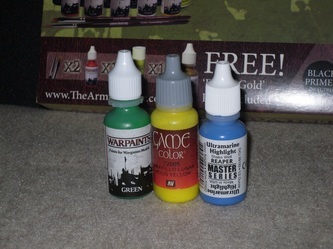 The Warpaints come in dropper bottles very much like Vallejo and Reaper Master Series. In comparison Vallejo bottles are 17ml, which is a hair over ½ oz (15ml), and Reaper Master Series are also exactly ½ oz bottles. So these are a hair shorter and a hair thinner than Vallejo, and exactly the same size as Reaper Master series dropper bottles at 15ml bottles. 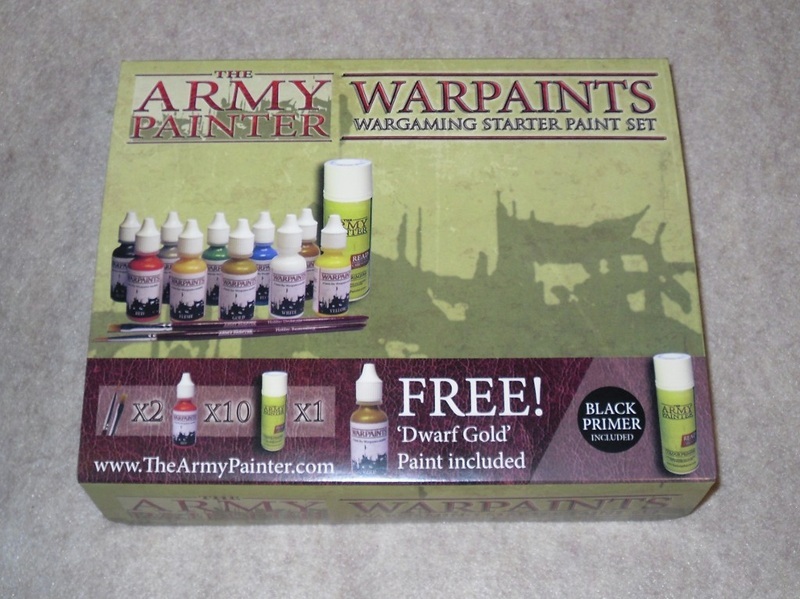 On one hand I really think this is an excellent starter paint set, especially for a new budding hobby/gaming enthusiast. The paints are almost as useful as Vallejo/Reaper Master Series, the colors offered include the basics needed, and it's a nice kit with a small can of primer and the two nice brushes to boot. It's pretty much the starter paint set that I wish I had when I first got into miniature wargaming ages ago. It doesn't get any better than this when it comes to Starter paint sets. This is definitely the perfect Christmas/Birthday present for a friend or relative who's new to the hobby/wargaming. On the other hand, at $37.50 USD it's a reasonable price, but not a great price. It just doesn't seem like a super value, because at $37.50 USD you're pretty much truly paying for everything in the box. If you wanted to just try their paints out, your stuck buying a small can of primer and two brushes along with them. 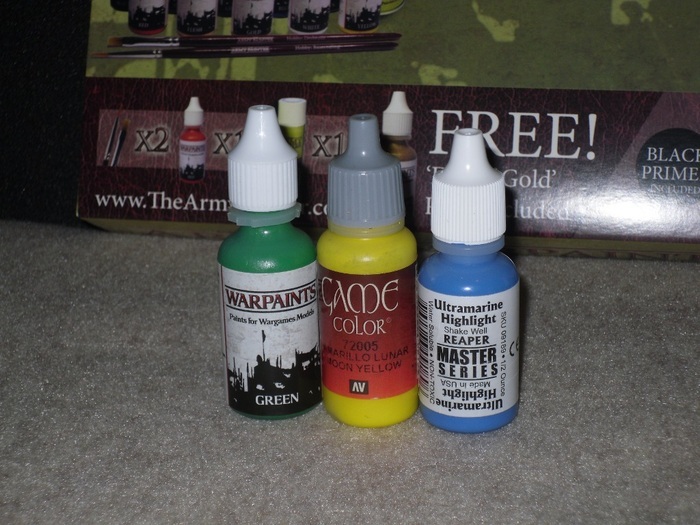 While Army Painter doesn't sell their own paints separately yet in single bottles, you can buy the very same single bottles of Warpaints for 1.75 GBP each, which converted is $2.69 USD each direct from Mantic Games in the UK. Under $3 USD for a 1/2 oz bottle of any quality hobby-specific paint is a good price, so no complaints there. Mantic also runs free shipping deals worldwide all the time, so they're definitely not out of reach for anyone. If I went by Mantic's single bottle prices, doing the math that's essentially $26.90 USD for the 10x bottles of paint in this set, which leaves $10.60 USD left over to cover the cost of the two brushes and the tiny can of primer in this set. At that price you're not getting much of a break, and it seems like you getting exactly what you're paying for at $37.50 for the set. To be fair, those are the $3-$4 USD variety Hobby branded brushes, so if anything you might be getting a break on that less than a half-can of primer for $2.60 USD, because a whole can is roughly $9 USD. But if you don't want the brushes and the primer, no mater what the deal is, it doesn't matter much, unless they're free. For $32.28 you could buy the entire set of all 12 colors in single bottles direct from Mantic. You shouldn't have to go to those lengths to get a full set, but at present that's the only way since Army Painter left Bone and Armour out of this starter set, and they're yet to offer single bottles themselves. 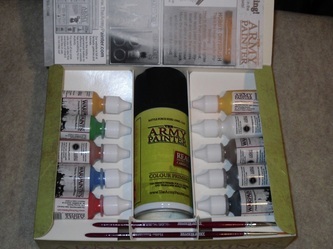 If Army Painter ditched the brushes and the mini-can of primer, and included the color Bone and Armour as well, and sold strictly a paint set with all 12 colors, that would be a set that would appeal to the existing veteran wargaming enthusiasts who also might want to give these paints a shot, but are put off by having to pay for two brushes and a can of primer that they don't want or need. It would also make sense to have a set with ALL of their colors in it, so you didn't have to go elsewhere. As for the paints themselves... I really like all of the non-metallic colors. I think they're almost right up there with Vallejo and Reaper Master Series, some painting enthusiasts even might think they're better, it's really that close in comparison. I use their Bone shade all of the time now, and I really like their Yellow and Brown a lot too. I'm just not completely sold on their metallics. I think the metallic colors could be a little thicker, but once applied to a model, they do the trick as nice as some of the other options available out there, which is what counts most. The dropper bottle design is also fantastic for Army Painter to adopt. Dropper bottles is my preferred storage and delivery method for any hobby paints, because you waste less, and they ensure the paint won't dry out too soon. 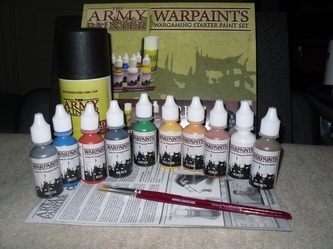 As it stands, this Army Painter Warpaints: Wargaming Starter Paint Set is the ultimate starter paint set for any new wargaming enthusiast, but veterans looking for just the paints might want to look to Mantic Games for the Mantic branded sets and singles to get the paints by themselves. I just don't understand why Army Painter doesn't offer a complete set to begin with, and why they don't at the least sell these in single bottles, this way customers wouldn't have to run to Mantic Games at all to end up with a complete set, or for the other colors they didn't include in their own set. The good news is that I'm told that there's more in store for the Warpaints line. There will eventually be new colors and other products available in the Warpaints range, but that's all I'm told at the moment on the topic.